I had so much fun making work for the “Metric 1:50” exhibition at the Para Foundation which opened April 5th. The whole show is scaled down to miniature so that it takes the form on an art fair or huge multi-room endeavor, it also allows for visualization of things sometimes hard to realize. 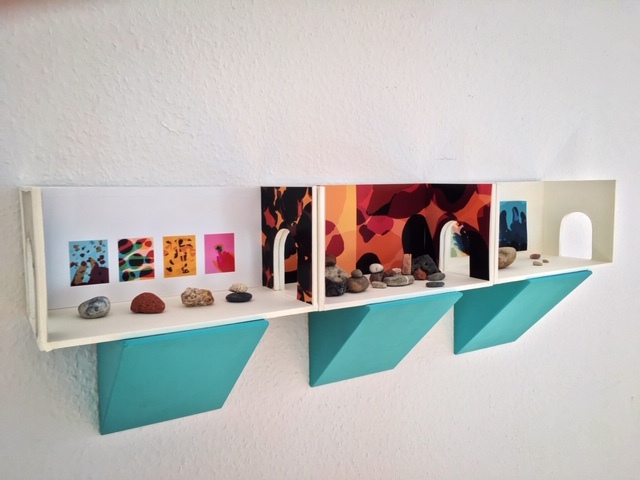 My work is three rooms (chambers) with color photograms from “Touchstones” of my rock collection and hand/fingers– an original 1:1 scale enlarged to wallpaper scale– and including the actual rocks and stones which now are the scale of boulders.